Heat oven to 400. In a large saucepan, combine quinoa and 1 c water and bring to a boil. Reduce heat to medium-low, cover, and simmer until quinoa is tender and the water is absorbed, 12-15 min. Meanwhile, cut zucchini in half lengthwise and scoop out seeds. Arrange in large baking dish, cut side up. Fluff the quinoa and fold in the beans, tomatoes, almonds, garlic, 1/2 c parmesan, and 3 tbsp oil. Spoon mixture into the zucchini. Top with the remaining tbsp of oil and 1/4 c parmesan. Cover with foil and bake until zucchini is tender, 24-30 minutes. Remove foil and bake until golden, 8-10 min. This recipe was really good, but my husband thought it wasn’t really a meal. It has all the elements of a complete meal, but it did seem more like an appetizer. I enjoyed it, though. My daughter liked the filling, but she wouldn’t try the zucchini. I was very excited to find another vegetarian recipe that looked filling and satisfying. I was hoping this recipe would work out well for me since I like cheese, zucchini, and carrots. As you see from the picture, I had a little trouble! 1. Preheat oven to 356 degrees F.
2. Line 2 baking trays with baking paper. 3. Remove pastry from freezer and let thaw slightly. 4. Combine the egg and ricotta, mix together and add in turmeric and a pinch of salt. 5. 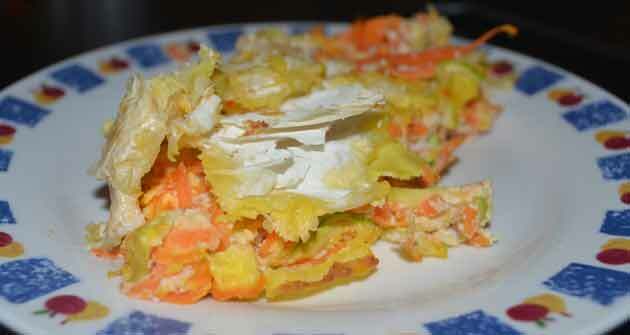 Add the grated carrot, zucchini and cheese, combine well. 6. Cut each sheet in half. Put a layer of mixture down the center of each piece. 7. Roll closed with the pastry rolling over itself so you end up with two long rolls. 8. Cut into desired lengths. 9. Brush lightly with beaten egg. 10. Bake until golden brown and pastry is cooked. So here is what went wrong: I first of all had a hard time finding puff pastry at my grocery store. Also, when I was reading about puff pastry I found that it is not the best health-wise, and that there are better alternatives. So at the store I was able to find Phyllo Dough which seemed, from the box, similar and healthier than puff pastry. I still don’t know what puff pastry is like, but I’m pretty sure they are not as similar as I thought. So it was not easy to make these vegetarian rolls using Phyllo Dough, and it stuck to the pan. Also, I thought I had turmeric, but I did not. From what I found online there is not a good substitute for turmeric, so I just left that ingredient out. Overall, the taste was quite good, but the presentation was not. I will try to make these again but with all the correct ingredients next time!